Is the Small-Cap Value Beta Still Relevant? HomeBusinessIs the Small-Cap Value Beta Still Relevant? It’s been 17 years since the professors Eugene Fama and Ken French penned the first of several papers that identified small-cap value as a separate equity beta worthy of special consideration. The basic idea is that stocks that are generally shunned by the crowd, as indicated by a low price-to-book ratio, are riskier than the market overall. Investors who are willing and able to hold this risk are rewarded with above-average returns in the long run. There are a number of theories for why small-cap value stocks generate returns that are higher than implied by the standard interpretation of modern portfolio theory. One idea is that small-cap value is a proxy for the risk tied to the economic cycle. During recessions, small-cap value shares are especially vulnerable and so investors are especially keen to shun this group. In turn, the fear generates an above-average expected return for small-cap value. A nice idea, but how’s it played out in the real world? Over time, the Fama-French 3-factor model remains intact. 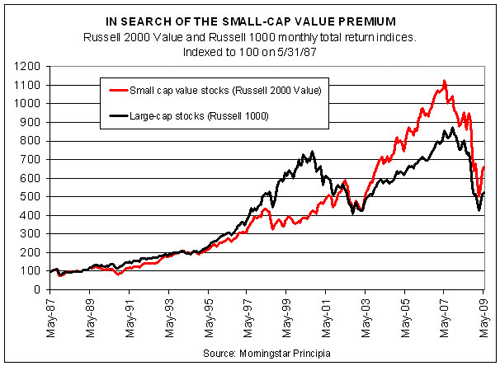 Consider the chart below, which compares small-cap value stocks (Russell 2000 Value Index) to large-cap stocks generally (Russell 1000) for the past 22 years. A $100 investment in each on May 31, 1987 would have grown to $660 in the Russell 2000 Value as of last night’s close—about 25% more compared with putting a C-note into the Russell 1000 for the same period. Of course, it’s folly to think that small-cap value outperforms each and every day, week and year. So far in 2009, for instance, the Russell 2000 Value has shed 2.7% on a total return basis while the Russell 1000 is up 1.3%, as of yesterday. And as the chart above reminds, small-cap value can and does suffer extended stretches of underperformance. In the late-1990s, for instance, large-cap stocks were unusually dominant, as the rising black line during that stretch shows. But then the tables turned in 2002-2007, with small-cap value soaring vs. the stock market generally. Is there an enduring small-cap value effect? It certainly looks that way, although it’s likely to be a rough ride in the short run at times. But if the small-cap value beta persists, which it seems to do, what does it suggest for investment strategy? One implication is that if you’re intent on trying to “beat the market,” raise your allocation to small-cap value stocks above the group’s weight in a broad market-cap index. Meanwhile, if you’re relatively risk averse compared with the average investor, hold a below-market-weight share (or even a 0% share) of small-cap value stocks. One could also make a case for dynamically adjusting the small-cap value weight through time in an effort to further elevate the return relative to passively holding this corner of the market. Indeed, the chart above certainly encourages this idea, although it introduces an additional layer of risk and one that’s likely to benefit only a handful of investors after adjusting for trading costs and taxes. As we reported in this month’s issue of The Beta Investment Report, small-cap value represented about 4% of the total market capitalization for U.S. stocks. Then again, even a buy-and-hold approach to small-cap value offers no guarantees. That’s why they call it a small-cap value risk premium. But as the empirical record continues to suggest, there’s an unusual amount of risk embedded in small companies trading a low prices relative to their book values. What’s more, the effect holds in foreign developed markets too, as a number of studies show. In the grand scheme of strategies that try to “beat the market,” this one appears durable for the long haul.